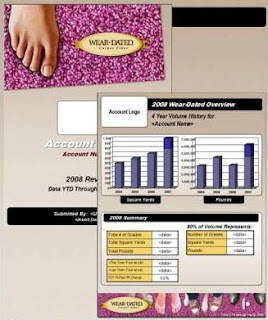 This case study describes the development of the "Wear-Dated Report Builder," which created presentation-ready reports filled with customer relevant product analysis data to support the placement of carpet styles made with Wear-Dated branded fiber at targeted retail accounts. When I joined the Wear-Dated carpet division in August 2003, the business was transitioning from handshake-deals to a consultative, volume-based approach based on data. Although we had plenty of data, none of it was easily extractable for use in consistent and coherent reports that could be used in consultation with retail customers. The only credible way to make product recommendations to retailers was based on insights obtained by integrating the data from three separate Oracle databases: a warranty database with information on individual carpet grades [weight, construction style and name], sales transaction data with volume information, and a retailer database. We needed a report that extracted the information relevant to a specific retailer, analyzed Wear-Dated product usage and recommended specific styles to fill product gaps. Starting in October 2003, I worked with IT to obtain limited extractions of all three databases [note: these were large files!] to start experimenting. Using Access, I learned how to run multiple query iterations that I validated against existing reports. Once the queries calibrated and the results consistent, I presented the information to the 5 Wear-Dated regional managers for agreement to proceed and for confirmation on the types of charts they needed in the final output. I also asked them to identify their top 30 accounts [out of 40,000]. These would be the accounts I focused on. The next three months were spent manually producing ~20 page PowerPoint presentations analyzing retail account Wear-Dated volume by weight and style, then recommending new carpet style introductions to fill product gaps for over 150 top tier retail accounts in time for Surfaces, the yearly flooring industry trade show that takes place in late January/early February. This first ever in-depth product analysis tool for use as consultative up-selling tool with retailer accounts to preferentially sell branded products was a big success and enabled the regional managers to have more productive, consultative discussions with accounts. The reports had made for higher level and pro-active discussions about how to drive increased retail business and create the optimum product mix to maximize margins. They led to additional placement of product made with Wear-Dated carpet fiber. After Surfaces, I debriefed with the regional managers to understand how they had used the reports, what feedback they had received and whether to continue. The response: a resounding yes! Given that agreement, the problem now became how to produce the same reporting results with less effort. However useful, that level of focused effort requiring three full months of my time to analyze data and manually produce reports was not sustainable. Could the process be automated more efficiently and cost effectively? Could reports be generated more frequently? In Fall 2004, I met with Blue Lacuna, a vendor specializing in automating the process of getting multiple databases to speak to one another, extracting relevant information into presentation ready, useable output to discuss the project. In addition to automating the process, I wanted to place into the hands of the end users [i.e., the regional managers], the ability to run reports when they needed to rather then when I was available, and as frequently as they required to support and grow business volume. With Blue Lacuna, I scoped out the end report requirements and mapped out how to extract the correct information. A major issue was the size of the databases which could easily cripple the operating system of the average laptop. Part of the process, then, would require "normalizing" the data. Once a workable program in place, we parallel-produced automated and manual reports based on 2004 data to calibrate results and ensure that the reports created for Surfaces 2005 retailer meetings were accurate. Half of the Surfaces 2005 reports were produced using the Wear-Dated Report Builder program, enabling more reports to be run and closer to the show date. As soon as Surfaces 2005 over, we were ready to put in place the 2005 Wear-Dated Report Builder program which now included monthly and quarterly updates. Individual end users produced their own reports via a user-friendly control panel [see the image below of the 2008 user panel]. Data updates and retailer logos were delivered digitally and automatically. Each individual report included a 4 year volume analysis in yards and pounds with a year-over-year analysis, breakdown by product style and weight, and by manufacturer, the top volume products and the top increasing/decreasing products. We also included national and regional benchmarking. - and enhanced the look/feel of the presentation template to reflect changes in Wear-Dated marketing campaigns. The final automated program generated best-in-class customized retailer reports, taking otherwise irrelevant and unrelated data and converting it into actionable information, all available in minutes to individual users vs. built manually over several months and at far higher cost. The automated report builder meant that reports could be generated for any one of the 40,000 customer retailer accounts at any time. Wear-Dated Report Builder created professional presentation reports that formed the backdrop for high level and pro-active discussions about how to drive increased retail business and create the optimum product mix to maximize margins. They led to additional placement of product made with Wear-Dated carpet fiber. Sandy Carter originally uploaded by IBM SOA. I'm back from the MarketingProfs B2B Forum 2009 in Boston and IBM's Sandy Carter wowed me with her presentation about integrating social media into the marketing mix! For any of you who doubt the value of social networking, IBM - in conjunction with MIT - has been Putting a Price on Social Connections [see original research on Value of Social Networks]. That's right, virtual friends have value! IBM has discovered a major source of new business resulting directly from the improved collaboration and listening, execution, value creation and more immediate response that Marketing 2.0 generates. Here's the fascinating lesson that Sandy shared: IBM has no social media strategy. That's right. Instead, it has a marketing strategy where social media is integrated and part of the tool kit. In other words, IBM is Bridging New & Old! Radical yet also highly intuitive, relevant and practical. Even brilliantly simple! Did you know that all IBM events now include a live 'Twitter stream' [i.e., they project onto a screen all tweets relating to the event in real time] so participants can immediately respond? Sandy shared details on projects in three of the ANGELS elements. A new web 2.0 product scheduled to launch in time for Impact 2008 combined social media with traditional approaches to better gather market intelligence, conduct focus groups, and obtain feedback from 12-15 countries around the world. 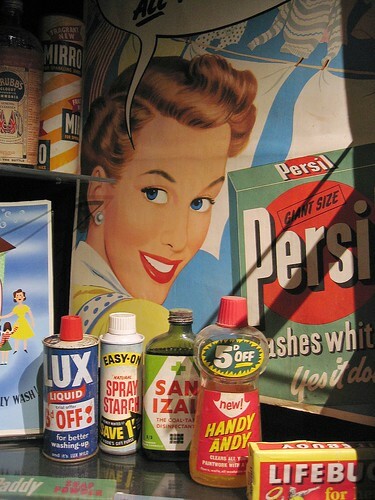 Social media helped gather product requirements via a blog, a Twitter account and a forum. In the first two months, the social media tools not only led to new topics and 4300 different postings. To get the word out, IBM let its community of IBM bloggers know; mention was made in LinkedIn and Twitter groups. As IBM obtained feedback, it created another iteration of the product for further feedback. After ~1000 betas [which did not elongate the cycle], Sandy's group had one of the most successful product introductions ever, accelerating it via Amazon web services partnership, at Impact 2008 [an in-person conference for not just the 13 IBM web developers but also the 1000 customers who considered themselves developers on the project because of their involvement]. Social media played a role in that product's Go To Market plan: names were solicited online for the product - resulting in sMash. IBM uses social media to go to market and drive demand. The opportunity arose as IBM asked itself, given the economy, how to get higher conversion from leads, particularly those relating to events. The solution was to have event attendance be less about the event and more about the community that the event creates; this resulted in a continual/perpetual campaign which now complements other marketing activities. To drive more people to events via the website, IBM discovered and implemented new bot technology - Vanessa - who presented offers in a social manner, inviting visitors to join and become part of community. A low cost solution [~$4k to create a bot], she yielded a 5x higher click through rate. She was used selectively as overuse decreased response, but she has been added to ibm.com/soa where she appears when there is something new to promote. Next, Sandy's group created a Linkedin group around the Impact conference and leveraged Twitter to drive traffic to the event. [This is similar to what Zappos and Dell do, offering that the next 50 to register, will be entered into a lottery for time with a subject matter expert. An experiment in Amsterdam with this kind of offer led to achieving 40% of promo registration target within 72 hours. The learning: relationship time is a number one grabber! Not free t-shirts. Also, IBM let customers help drive people to event with customer-driven registration, and customers recommend options... One customer did a take off of SouthPark video, to drive people to the SOA conference posted on YouTube. IBM created viral videos based on banking customers showing results obtained from using IBM. Wow! All of these tools can be measured, by the way. The results: a 10% uplift in conference registration for lo/no cost with 540+ additional registrants. Impressive! To ensure that the event wasn't simply the end game, Carter created a community around the topical area. After an initial failure building an IBM community site, she opted to go use a 3rd party - InfoQ - with IBM sponsorship to create SOAsocial; it received 3000 unique customers per month, offering customized content by audience. Participating are user groups, partners, academia, industries, all organized by role; they have a single common place to go to for relevant information. Members collaborate, ask and answer questions, and conduct polling. IBM wanted to encourage topics to bubble up. A new one even developed around analysts. The community generates co-created content. A university in London has been active on site, setting up assignments, questions, and conducting research. Profile information includes personal experiences to facilitate relationship building and credibility. The website includes links to all communities and groups. Depending on what your tool of choice is, the options are there. No surprise, LinkedIn is stronger than Facebook because that's where IBM buyers are. A Flickr account has been established. With so many events taking place in 100 cities around world, competition to take and post photos between event cities has been encouraged, helping to generate attention. Furthermore - and this I consider fascinating - IBM has learned from seeing the event from their customers' eyes. It has done the same on YouTube [this is the YouTube channel for WebSphere Education from IBM]. As with seeing events from their customers' eyes, videos enable IBM to listen to better understand how customers talk about products. This has let to changes in how products are described and referred to which then leads to changes for SEO, marketing materials and messaging. Other benefits realized: over $100K savings because IBM didn't need as much staff to travel to events; speakers were better educated, and professional photographers weren't necessary because attendees took pictures. Tweets and blogposts meant less manual reporting, too. 8000 people out of 15,000 have downloaded the widget; 6000 still actively use it. Widgetbox created it -- the first for free; the second cost $5K to $7K [up to $15K for a fancy widget]. From Nordstrom [i.e., a B2C], Sandy borrowed another tool: LivePerson to offer live chat with commentary triggered by certain online behavior patterns. IBM now has a popup window to have a dialog with users. The sales team sits behind the chat window monitoring so it can react appropriately. It's the most productive sales team in all IBM because the customer is pre-qualified. Marketers can customize when the window pops up. LivePerson ROI = 56X. Once again, as a result, customers found IBM easier to do business with and that they listened better. IBM decided to run a virtual event because so many people can't travel to attend events. ON24 created the interactive virtual event. It wasn't just a webcast. Attendees created an avatar to participate and visit demo booths; they could chat and visit coffee rooms to interact. [IBM even charged virtual booth sponsorship fees.] The feedback was phenomenal. Sandy's team expected 500 to attend. Instead, 3000 did! They've now done three such events. They are effective and the conversion rate is similar to that of live events, at far lower cost. 5. Tune your marketing mix. What are your reactions? To me, Sandy Carter's examples and success stories demonstrate how beneficial integrating social media into the marketing mix is. Do you see how you might start experimenting? Q&A with IBM's Sandy Carter: What’s the Recipe for Marketing Success with Social Media? Nature's Magnifying Glass originally uploaded by Jeff Holbrook. In Simplifying Has A Lot To Do With Green, I observed that green and simplicity go hand-in-hand. That 'spirit of simplicity' seems even more relevant as the marketplace re-evaluates priorities, in search of brand value that aligns with newly rediscovered values like simplicity, responsibility and community -- as several recent articles reminded me. For example, Hugh Hough's 5/13/09 article The Sky May Not Be Falling, But The Ground Is Definitely Shifting. He identifies three developing consumer themes that brands should embrace -- chief among them being simplicity. 1. Simplicity - with many consumers being forced into scaling back, they are rediscovering a return to basics and "more simplified version[s] of their daily lives." Furthermore simple takes on new meaning as "simpler will coexist with smarter." 2. The conspicuous absence of conspicuous consumption. Also part and parcel of the simplicity move: a "rejection of ostentatious displays of wealth. More and more, these will be seen as evidence of greed and selfishness, or at best, cluelessness." The solution? Have your brand embrace substance and meaning relevant to your consumers. 3. The community will get broader and deeper. This point is fascinating and ties into why social networking and the tools of social media offer so much potential for those brands that embrace the spirit of simplicity and community [including with employees!]. The author writes: "When people aren't confident, they look to others for help. Acts of collaboration, while borne of necessity, will forge a spirit of solidarity that will carry on once times get better. A larger sense of community will emerge." Sustainability Is More Important Than Ever by David Almy from 5/27/09 states that companies taking sustainability to heart have unique strategic advantages available. The reasons? 5. Sustainability-aligned brands can weather tough economic times. BBMG -whose co-founder Raphael Bemporad I met at the LOHAS event referenced in the first post above - recently conducted the second national study on purchasing behavior and social values titled BBMG Conscious Consumer Report. The study, per the "BBMG Study Finds 'Green Trust Gap' - Interest in Green Holds Despite Recession, But Consumers Lack Confidence in Green Claims press release, reveals the challenges inherent to pursuing sustainability because of deep consumer skepticism over green claims. Nonetheless, "consumers are redefining what truly matters and evaluating purchases based on both value and values." Price, performance and purpose matter. The way to bridge the 'green trust gap' is "by telling authentic stories and empowering a consumer tribe to share ideas, experiences and influence" -- which gets us back to community and the powerful tools of social media. For more on that subject, I recommend a fascinating post from Richard Matthews at The Green Market Blog: Social Media and Sustainability. Simplicity, responsibility and community make total brand sense to me. Does it to you? What is your reaction to this Spirit of Simplicity? And, how might your brand embrace it? In this and several other posts, I will describe in the form of case studies projects that capture what Simple Marketing Now might offer you and your organization. This case study describes the steps my team and I took to transform the Wear-Dated Upholstery Fabric business of Solutia Inc. When Monsanto spun off its chemical companies into Solutia Inc. in September 1997, I became Business Director for Acrilan Home Furnishings and, more specifically, Wear-Dated Upholstery Fabrics, a special $22m gem in our business portfolio. In addition to ensuring a smooth handoff from Frank W. Swift, who had created and nurtured the business concept with Joe Buck [who remained part of my team], I had to transition it from startup to established business and transform it to ensure growth opportunities. My team consisted of a multi-location sales and marketing team of 8 professionals based in the U.S. and in Mexico City. After methodically evaluating the marketplace and understanding perceptions that fabric mills, retailers and retail salespeople had formed around the Wear-Dated brand, not to mention the value we brought to the marketplace, we learned that our brand looked industrial and un-appealing to the residential marketplace. If we intended to expand into the residential upholstery market, we had to address our brand image immediately! If we could reposition the brand from industrial to fashion + performance, we had the opportunity to broaden our reach from velvet-only motion furniture [i.e., recliners] to chenille and flatwoven fabrics for stationary and higher-end furniture. We developed new brand positioning which we validated through qualitative research with consumers, retailers and fabric mills principals, resulting in the brand image you see above. It allowed us to successfully expand into the stationary furniture marketplace. Once the brand relaunched, we were able to focus on how to grow the business. To increase awareness of the brand with retailers and retail salespeople, we launched www.weardated.com and www.setsalesonline.com for retail sales people in the upholstery business. We saw a 130% increase in retail salesperson incentive program participation. We expanded the Wear-Dated Upholstery program to Canada and Mexico; and explored expansion to the UK, Scandinavia and Brazil, conducting consumer focus groups and meeting with local retailers to better understand opportunities. In response to marketplace demand for a cotton-like fiber, we developed and introduced a revolutionary new premium-priced fiber product (Ginny®) that significantly expanded Wear-Dated brand product selection and further solidified our position with higher-margin, better residential upholstered furniture. Finally, given the consultative nature of our brand relationships, we held yearly 5-day offsite strategic summits, for 200+ residential upholstery leaders, which I led. These sessions were invaluable, strengthening relationships, increasing brand value and addressing critical issues ranging from how to better address the needs of women furniture consumers, improve the retail experience and nurture innovation. We doubled the size of business in the first 4 years to $50m. We were honored with Solutia’s Customer Focus Award for 2000 for growth in the Wear-Dated upholstery program. Please visit Simple Marketing Now | Case Studies for other examples of projects I have been involved in. Are you hearing more about blogs and social media? Do you want to learn more? Perhaps the interview I did last week with Kemp Harr on FloorDaily.net will answer some of your questions. You see, Kemp asked that I help his listeners understand what social media is about - a subject I'm only too happy to discuss! Not only did he ask about blogs in general, but he gave me an opportunity to discuss the CRI Blog -- remember CRI and Simple Marketing Now launch Carpet and Rug Institute Blog? -- more specifically. The interview is 9 minutes long. I discuss what are blogs: self-publishing web-based platforms that allow individuals and organizations to post articles and stories that are relevant to a reader base on a regular basis. The value of blogs: blogs allow you to take part in the conversations happening around your brand, company, industry or hot topics. If you take part in the conversation [remember, markets are conversations], you can learn from the interaction and help shape the discussion. If you don't, you abdicate participation in both the talk and any kind of resulting action. For the CRI - and chief blog contributors Bethany Richmond and James Beach - the CRI blog means being able to highlight carpet related research and resources [i.e., that combat myths around carpet and allergies or explain how carpet improves learning in schools] that are otherwise difficult to find, and also to translate the information into something meaningful and relevant to readers. Bethany posted a terrific writeup [see CRI Blog Consultant Christine Whittemore Interviewed on Floor Daily and says nice things about me, too. Thank you, Bethany!] with links to the Health Magazine example I refer to in the interview. Kemp asked how to find blogs: start with Google blog search and consider looking at Technorati, a blog search engine which identifies a blog's authority or credibility [a result of regular posting or publishing, relevance and links from other sources]. Another is Alltop which organizes blogs into related topics - it's a very cool site. If you'd like more information, you might check out a previous post, "Blogs are now mainstream media. ", which includes the slides from a recent social media 101 presentation. Jim Gould from the Floor Covering Institute emailed me saying that he "thought [the interview with Kemp] was outstanding. Not only did I learn a lot but I think I am starting to understand this stuff." Yeah and thank you, Jim! As it relates to the CRI blog, I'm very pleased with its progress. The first post went live on April 7th, 2009. Since then, Bethany and James, who have done a terrific job embracing the medium, have published 19 blogposts. All help tell the Carpet and Rug Institute story and increase its visibility and relevance to anyone in the marketplace interested in learning more about carpet and the environment, carpet and allergies, carpet and learning environments, and generally how carpet truly enhances the living environment. To highlight the blog's progress, here is the status report I presented on June 1st on the CRI Blog's first two months. As of yesterday, the blog had 106 subscribers! Very cool. It's still very early in this blog's life, but I'm looking forward to witnessing how it develops, discovering which stories particularly resonate with readers, and hearing the resulting conversation. 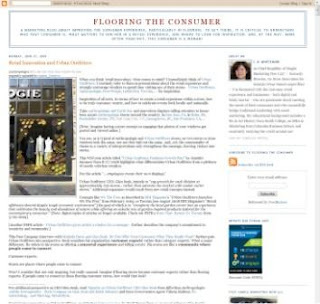 If you haven't already, you might visit the Carpet and Rug Institute Blog. If you like what you see, or have ideas for topics you don't see, do let Bethany and James know. They'd love to hear from you. Congratulations to the CRI Blog and Bethany and James! 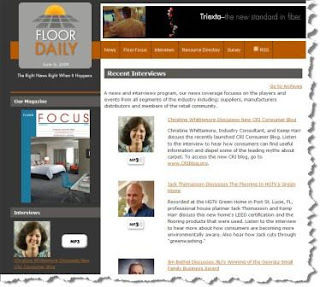 And, thank you Kemp Harr at FloorDaily for the opportunity to discuss a subject I greatly enjoy! Brands and Packaging originally uploaded by missmac. Jonathan Salem Baskin, author of Branding Only Works on Cattle: The New Way to Get Known (and drive your competitors crazy) , recently shared his branding wisdom [or heresy!] 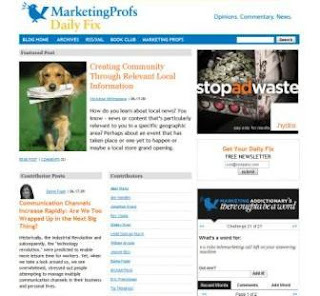 on MarketingProfs in an online seminar titled What Matters Now in Branding: Ten Ideas to Get Refocused. The traditional notions of mass market branding - based on mass channels of distribution, communication and consumption - are no longer relevant to today's consumers. Rather, branding today is about reality, context and community. Why? Because consumers can see through hype. And, if they can't, they aren't willing to automatically trust traditional branded messages. Realize that consumers now access information differently. They do so on their terms, at their convenience and no longer how, when, why and where traditional marketing determined. Ironically, Baskin reminds us that consumers today more closely resemble those of the pre-mid 20th century [i.e., before mass branding strategies took over], with the same needs for information, certainty, reliability, authority and sustainability. In other words, the days of Mad Men and Madison Avenue represented an anomaly rather than a norm. And the tools of social media take us back to how business used to be done, based on relationships and exchange of information and conversation. Or, in Baskin's words, new technologies allow us to behave in a more natural way with conversation, agreement, belief, loyalty, referrals and community. Which means that brand is about behavior and generating action, and - as marketers - our role becomes about making the brand relevant to behavior. 5. Integrate your branding over time. 6. You need to build real communities. 7. Everything is a service. 8. Choices need to happen in reality. 10 Seize the day and take action - only if you have the new definition of branding in mind. "Doing is the new thinking," he says. If you can't experience the recording of the seminar, then definitely download a copy of Jonathan Salem Baskin's ChangeThis Manifesto titled "10 Rules for Branding in a Post-Branded World." Or, spend time on the Dim Bulb, his blog. And, then, think about how to refocus your brand so it is more relevant and meaningful to your customers. What kind of action does it generate? Brooklyn Bridge (3) originally uploaded by Life in LDN. I love discovering resources and references - particularly ones that relate to social media tools. Most continue to evolve rapidly and I inevitably learn something new when marketers share their practical take on how to make best use of social media for marketing. For that reason, I share with you these links of note for social media marketing references. + My Northern New Jersey neighbor, Steve Woodruff, has developed an excellent e-book for getting started in social networking. It's titled Build Your Own Opportunity Network and includes practical advice and valuable links to other resources. + CK always keeps me grounded and, in CK's Blog, she includes a page full of wonderful resources for Social Media: Planning Checklist [Questions to Consider]. + Beth Harte from The Harte of Marketing shares a powerful presentation that she created for the Greater Fort Worth Chapter of the Public Relations Society of America [PRSA] titled Implementing & Measuring Public Relationships…You can do it! 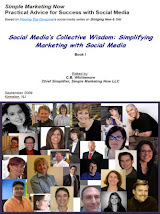 and filled with practical advice on how to effectively measure, monitor and be successful with social media. + Finally, Conversation Agent Valeria Maltoni has developed Why Blog + 25 Tips to Make it Work. Are there other practical resources you've found valuable? Let me know and I will add them to this list. Perhaps you've heard about The Age of Conversation? It's a marvelous project, bringing together bloggers and writers from around the world to benefit Variety, the Children's Charity. The first Age of Conversation was published in 2007: 103 bloggers from 24 states and 10 countries participated. Age of Conversation 2: why don't they get it? was published in 2008. 237 bloggers from around the world contributed. It has just recently become available on Amazon as I explain in Age of Conversation 2 - Why Don't They Get It? on Amazon! The first Age of Conversation is still available for purchase on Amazon, and definitely worth acquiring. You see, it's full of wisdom and insight. Or, read my chapter - The Conversation Age Enabled - in its entirety. Imagine being deaf, dumb, blind – like Helen Keller – caught in your own world with no way out, perhaps filled with brilliant discussion, conversation, and brainstorms, but only with yourself. 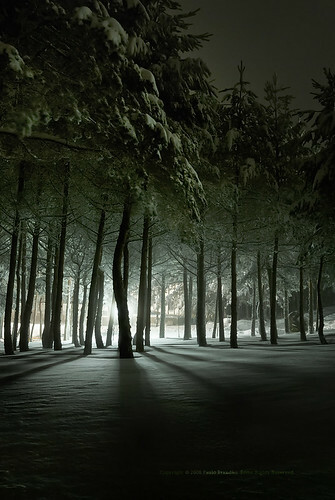 As enlightened and clever as you may be, you stagnate for lack of newness. Your world is a closed loop, a closed system. Then, imagine an ‘enabler’ entering your world. 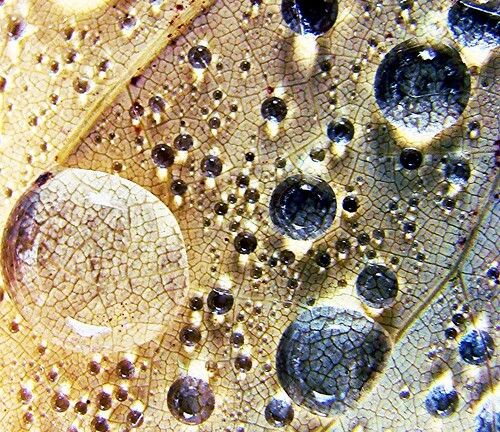 For Helen Keller, it was connecting water [a physical object] with language [an abstraction] – language consisting of words, sentences, context…. Language allowed her to take part in the world of senses, despite her handicaps. It compensated for them and became a path to new concepts and ideas, to communication and creating value. Language transformed Helen Keller and her life experience. Similarly, an enabler has entered our world: Web 2.0 and social media. Where we were once isolated in a mostly bland, slow-moving world, we now enter a richly alive environment where information flows like water out of a faucet – Google it, Mapquest it, YouTube it or check it out on Wikipedia. Answers are readily available. Books – once static entities – have become entry points for ongoing discussions with authors. Corporations – once cold, faceless entities – can now express personality and demonstrate commitment based on input from its community! Tremendous enthusiasm or passion for a topic no longer signifies eccentricity. Rather it signals engagement and enriches conversation, transforming the experience, adding dimension and relevance. We no longer have to face the world alone. Advice, success stories, best practices are readily available through blogs, discussion groups, book clubs and online forums. We have but to ask and acknowledge interest. Access to information, once the domain of a select few, has been democratized. Anyone with curiosity, with the desire to develop better ideas or solutions for solving philosophical quandaries, branding dilemmas, or business strategy fiascos can take part. Ideas – through online discussion – can be combined, perspectives from around the globe added, multiple disciplines taken into consideration and everyone’s opinion as it relates to the human experience intertwined! As dizzying to the non-initiate, the choices available in the Conversation Age enable a true conversation, with information flowing in both directions. Envision responsibility, authenticity, accountability and integrity as the current. As with water flowing out of a faucet, just a sip refreshes and revitalizes. Immerse your whole being and realize for yourself how welcoming and conducive to brilliance it is. Realize, too, how quickly you adapt to it. It truly represents a conversation enabler for all.